This is a novel written in communist Albania in 1981 but set in a fictionalised version of the Ottoman Empire in, I guess, the late 19th century. The protagonist, Mark-Alem, is from a family, the Quprilis, who are originally Albanian but are living in Istanbul and are prominent, powerful players within the Ottoman Empire. The book follows his career working at the Tabir Sarrail — the Palace of Dreams — a huge office devoted to collecting, sifting and interpreting the dreams of people from all across the empire. Once a week, a single dream is chosen as the Master-Dream and delivered to the Sultan, along with its interpretation. The Palace of Dreams was apparently banned in Albania on publication, and you can see why. As a piece of political commentary, it is necessarily somewhat oblique, as this quote from Kadare points out: “dissidence was a position no one could occupy, even for a few days, without facing the firing squad. On the other hand, my books themselves constitute a very obvious form of resistance”. Still, the vision of a government trying to reach right into the minds of all its subjects, of a huge sprawling bureaucracy devoted to tracking and recording people’s thoughts, the brutal interrogation of people who are unlucky enough to have ‘significant’ dreams, and the way the process is undertaken with great seriousness but seems to be completely arbitrary: it’s a pretty good metaphor for a totalitarian government. I find it quite hard to think of this as a book written in my lifetime; it’s not just the setting, but tone and style. The most obvious comparison would be Kafka — there are descriptions of getting lost in the corridors of the Tabir Sarrail which are particularly reminiscent — but also someone like Bruno Schulz, perhaps. Early/mid C20th, anyway. Although this edition, which I picked up in a second-hand shop, was translated from the Albanian via the French, so I don’t know how that may have affected the nuances. Still, it’s a striking fable. It’s very much built around one central concept, but it’s short enough that that’s not a problem. The Palace of Dreams is my book from Albania for the Read The World challenge. 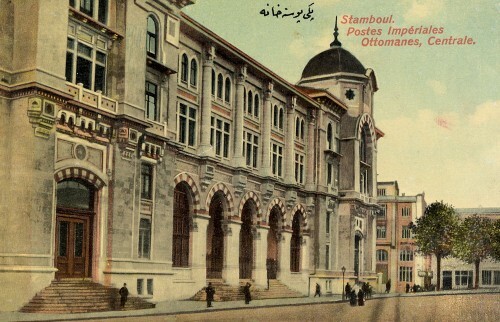 » The postcard is, as the caption says, of the central post office in Istanbul. Which is at least a big Ottoman bureaucratic building. I found it via Ottoman Imperial Archives on Flickr.